Larry Lannom (Vice President CNRI, Virginia): What is it? Dimitris Koureas (Head DISSCO Coordination Team): Why to do it? Christophe Bianchi (Executive Director DONA Foundation): How to do it? Between key actors who worked on the concept of Digital Objects within the Research Data Alliance, the Swiss DONA Foundation and on implementing the FAIR principles in the GOFAIR initiative there is agreement about the fact that Digital Objects  and the FAIR Principles  are steps towards convergence in the digital data domain and are complementary [3,4]. The concept of Digital Objects with its capacities of abstraction, of binding all relevant information together such that machines can find it and its potential for encapsulation  is a way to implement the basic FAIR recommendations and to facilitate the others. This has also been indicated in the recent report of EC's FAIR implementation expert group  and in a recent workshop in Brussels . Assuming that the FAIR Principles are now widely known, in this webinar we want to present the concept of Digital Objects (DO), discuss it from a computer science and domain science perspective and present the DO Interface Protocol (DOIP)  which has the potential to establish interoperability between repositories of digital data independent of the way they are organising their data and which data model they are using. As surveys have shown these differences account for a large percentage of the inefficiencies and costs in data projects in research and industry. 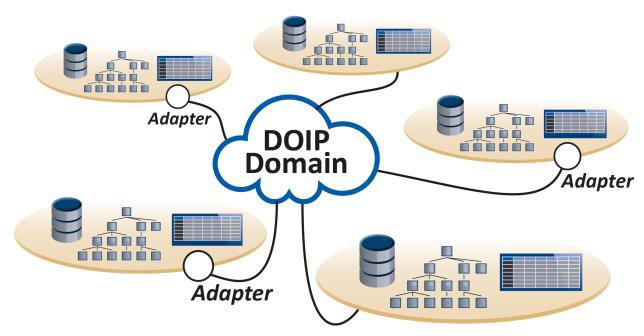 As is indicated in the diagram, the DOIP takes over a similar role as TCP/IP some decades ago and it has the potential to open a new phase of improved exploitation of the rich data collections we are gathering. DOIP will be free to use and free of charge to everyone, and it will create an interoperable data square which will not be owned by anyone as Internet is not owned by a particular institution or company - the infrastructure is simply there to be used. This webinar will be recorded and available through the GEDE (Group of European Data Experts) web-site and it will be repeated in January 2019 to allow many to participate and ask questions.